Discussion in 'Canon InkJet Printers' started by Digross, Oct 18, 2018. What should I do with my headless printers? I have a Canon 9500 and a 9500 mark II. I tried getting a cheap head for the 9500 on E-Bay, but one channel didn't work at all. Now, I've read that if a whole channel disappears, it is an electronic failure, AND the printer might be fried, and it might destroy any head you put in it! So, now I have two headless printers and about $250 in PrecisionColor ink! Do I throw them away? I can't find cheap heads, and for all I know, they will fry any head I put in them. (I bought a Canon Pro 100, so I can print again). Ideas? I'd love to use my pigment inks. I am sorry that the cheap print head didn’t work out for you, but there is no such thing as a free lunch, (Caveat Emptor) why would the guy be selling the heads so cheaply when he’s trying to make money, because a proper new head would cost twice the price.. The Pro 9500 mk2 would be worth saving but a new head is costly from (Canon US) and just because the EBay head was duff when you purchased it doesn’t mean the printer is also now duff, if the printer had got damaged then you wouldn’t have been able to retrieve the head out of it. The Pro 100 is a great printer but so also is the Pro 9500 mk2 and there is no reason to dump all that good pigment ink instead of using it to produce beautiful prints, on the other hand the Pro 9500 is a bit of a waster and eats ink, so retirement is the better option for that machine.. So, now I have two headless printers and about $250 in PrecisionColor ink! Do I throw them away? Maybe someone here with that printer would gladly purchase them from you? Just a newbie idea. In Europe, genuinely new printheads for the Pro9500/9500II seem to have vanished for good. They’re unavailable at Tasktron in the UK, C1 Supplies in Germany and Eparts in France, three of the more reliable online vendors. It’s very likely that Canon stopped the manufacture of QY6-0077 printheads some time ago. Possibly Canon USA has still a sizeable stock of them. Who knows ?. Anyway, the writing is on the wall. Considering Canon product’s policy, those Pro 9000 and Pro9500 series are already “vintage” models. I feel your pain. When I switched from a "i" series (i560) to the 'iP" series (iP4300) I did so based on the bulk ink stock I already had which was only a couple years newer. Other than re-using the ink, there was a Win& driver package available unlike the i560 which I had to stand on my heard to get the additional files from M$ to make it work (a real nightmare). 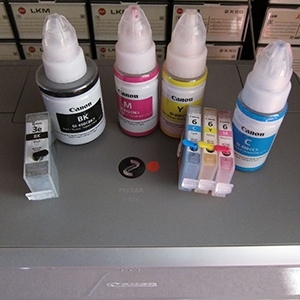 The Chinese refurbishing companies use original Canon printheads, but their track record is terrible (1st hand experience). It may be better with your model (I'm not sure when that was introduced). Between e-bay & Amazon look for sources and see what their return.refund policy is. Most are in China and ship from there which is a negative. I found delivery time to the US is around 2 weeks and return postage (USPS) is $15US if they request a return and won't pay for the return which I haven't encountered yet. The four that were defective (not all the same seller), any returns were on their 'dime'. Admittedly, I'm not familiar with your model. If you prefer to stay with it, keep on tiring. Mind you, I'm not recommending them one bit, just one source. There are others, they seem to be the most common.